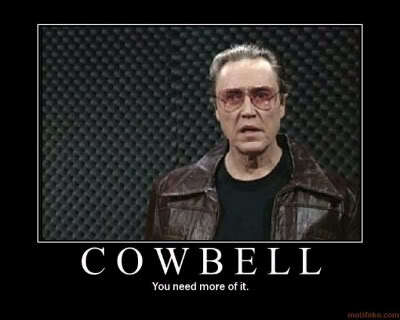 And the only prescription...is more cowbell! Seriously, though, I feel like writing is like a fever sometimes (to be dramatic about it). When I'm sick, I can't get comfortable. I feel like I'm crawling out of my skin. And by day three or four I'm so sick (pun intended) of lying on the couch that I feel like I will literally die if I don't do something active (more dramatics). Back when writing was a hobby for me, it was easy to take it or leave it. Mostly leave it. Because writing is hard, y'all! But now I've fallen in love with it. Writing is what I want to do forever. I want to be able to call myself a writer and not feel like a fraud, or like this is some temporary diversion until I buckle down and get a "real" 9-5 cubicle job, complete with fuzzy fabric walls and terribly unflattering fluorescent lights. So these days, when I'm plowing through a chapter, or a treatment, or a script, I get that same antsy, uncomfortable feeling if I'm not working on it. It's a nagging at the back of my mind that won't let me rest. A shouty voice telling me to get my booty off the couch and back into that desk chair. Maybe that's what they call passion. I call it The Fevah!